Vocoders rely on two signals being present at the same time in order to operate. These signals are the Carriersignal, which normally takes the form of a synth, and the Modulator signal, which normally takes the form of a human voice, although other instruments can work well (such as drums). The Modulator signal is analysed by the vocoder and broken down into a number of frequency bands. The more bands that are available, the better quality of the analysis, which means that a clearer vocoded sound will be available. A typical Vocoder synthesizes a modulator (usually a voice) in the right channel of a stereo track with a carrier wave in the left channel (any active sound) to produce a vocoded version of the modulator (right channel). CUSTOM VIBE is a modern variation of classical organ and guitar effect, and one of the unique effects ever created. Original Uni-Vibe (TM) pedal was designed in 1968 by Japanese company. Main idea was to recreate the Doppler effect or the sound of a rotating speaker but result turned out to different sound. The curcuit is phaser that industry create later, and this effect based on photo-cells. Later many companies build own versions of Uni-Vibe (TM) effect based on phasers, delay, chorus modulations in various proportions. and sizes. Later industry create more deeper Phaser effects. CUSTOM VIBE is a modern variation of classical organ and guitar effect, and one of the unique effects ever created. Original Uni-Vibe (TM) pedal was designed in 1968 by Japanese company. Main idea was to recreate the Doppler effect or the sound of a rotating speaker but result turned out to different sound. The curcuit is phaser that industry create later, and this effect based on photo-cells. Later many companies build own versions of Uni-Vibe (TM) effect based on phasers, delay, chorus modulations in various proportions. and sizes. Later industry create more deeper Phaser effects. Introducing a new three band multiple FX Rack Extension. The Crossover effect splits the incoming audio signal into three bands [Low / Mid / High] with frequency control and morphing. If you connect any signal to the Main input and activate the Crossover section, you will have 3 bands. This classic crossover effect includes Low and High Frequency control for morphing around three bands. SABOTAGE is a three band crossover effect that splits an audio signal into Low / Mid / High bands, sending the signal to the Main Output and individual 3-band outputs, but it’s not just a crossover effect. The main principle of the device is a 3 band crossover with band effects. Every Band [Low / Mid / High] includes its own effects allowing you to morph between these three bands and their effects. The device also includes Break Inputs for additional incoming signals for each band. 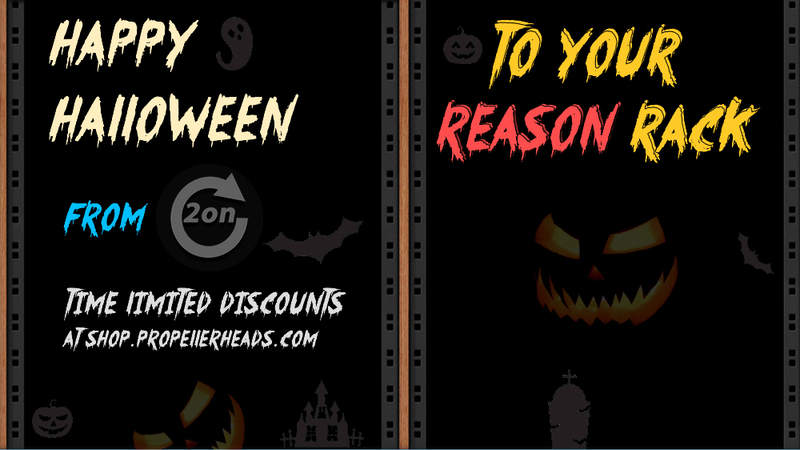 Only 30 October include 1 November discounts on RackExtensions at Propellerhead shop. Happy Halloween! ECRUOS is a Delay effect with up to 16 configurable taps include smoothing of delay time changes. We present new delay type in Reason Rack Extension – Tap Delay. Tap Delays usually have steps called as TAPs. Every TAP have own setting of Delay Time and Level. Delay Time in ower effect can be Synced to your song project or set in seconds. Feedback control linked to each TAP. You can manipulate how much taps you need. Just try to draw your delay rhythms by TAPs. Taps can control PAN of each step. We aso add Filter to this Delay device. Taps can control Resonance of each step. With ECRUOS you can create new structure sounds from one note signal or any other source of signal. Draw your Delay for new rhythms now. Try it today! Introducing a new Comb filter with positive/negative morphing in Rack Extension format. Comb filters usually reshape waveforms, ending upwith a signal that resembles a comb shape.Comb filters create copies of signal and work as a delay and filter at same time. Small delays between copies of the signal create phase offsets and the sum of them builds peaks. Filter Frequency sets the length between these peaks. Resonance sets the strength of resonant peaks at the cutoff frequency. As result, you have newly shaped waveform named as the Comb filter line. Actual standards of Comb filters have selections of Positive and Negativemodes. Positive and Negative modes have peaks at 0Hz. Classical Comb filters normally use selected positive or negative modes, but we allow morphing of these modes at the same time. The device includes two individual Comb filters with customizable settings which you can morph between. With DoubleComb you can really do more then you can do with other classic Comb filters. Introducing a powerful rhythmic cutter effect. With the MURDER rack extension it is possible to generate various arps and sequences with a few effects to create new complex rhythms for any incoming signal. With GRID SIZE you can cut incoming audio signals into slices in steps that are synced to your Reason project tempo. STEPS PER BEAT sets the number of steps that are grouped as one beat. The RHYTHM MASK section includes up to 8 steps. In the GATE CREATOR section you can control Gate Depth and Length of gated steps before they are muted. Also, this section contains a Filter (HP/LP morph filter) for gated steps and a random filter per step. The RECREATE section controls Repeat and RePitch effects. The REVERSE section controls playing mode in reverse with an offset. MURDER is a powerful creative engine for your tracks.